Situated along the Monocacy River, Buckeystown, Maryland, Hedgeapple Angus Farm, with a legacy dating back to 1731, has operated as both a dairy and beef farm since 1956. John Wilkes paid a visit. Conservation and stewardship of soil and water resources is central to Hedgeapple Angus Farm’s management practices to improve water quality of both the Monocacy and Potomac rivers and the Chesapeake Bay. It is a sustainable model farm, using techniques which can be adapted from the Mid-Atlantic region to North Carolina. Central to its mission is its non-profit research foundation and farm education programme established in 1997 by the Jorgesen family to support and make profitable small- to medium-sized sustainable grass-fed beef farms. Hedgeapple offers free technical advice, farm tours, field days and workshops. All research is shared, including financial data of its production and sales. Hedgeapple Farm’s 220-hectare (544-acre) unit supports a 400-cow pedigree Black Angus herd. All cattle are grass finished and sold through an on-farm retail market. The farm’s innovative vertical integration doubles as a training facility and teaching resource. Executive director Dr Scott Barao has managed Hedgeapple Farm since 2005. He received his PhD in beef cattle nutrition and management from Michigan State University and for the next 20 years he served as beef extension specialist at the University of Maryland. At Hedgeapple, warm season grasses are able to grow for much of the year. Dr Scott Barao with grass-fed Hedgeapple Angus ribeye. "People produce junk and call it grass-fed beef and it makes me crazy. The problem is there is no real definition of grass-fed"
Hedgeapple Farm attributes its success to its maintenance of high quality standards. It produces consistent superior meat which is 100 per cent grass-fed and grass-finished, with no added hormones, implants or antibiotics. Dr Barao says: “Ironically, the number one sales driver for us now is local, then grass-fed. I guess we are ‘natural’ as well, whatever that means. 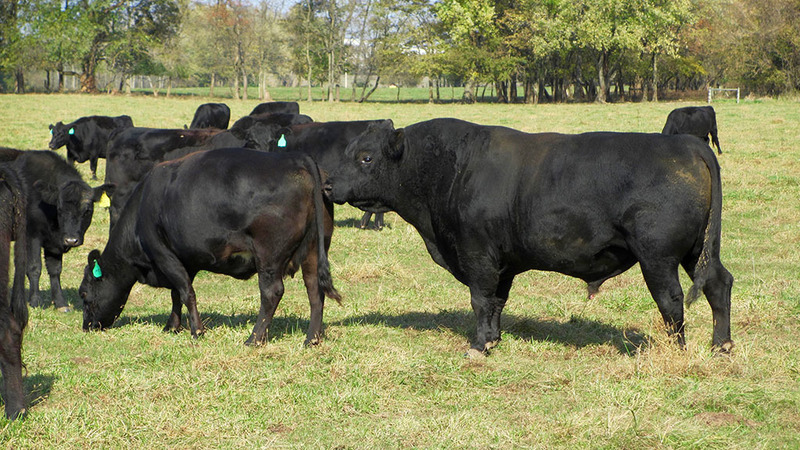 The Angus cows bred are moderate-framed, thick set and heavily muscled, with an average weight of 550kg. The cows thrive on a forage-based diet, spending between eight and nine years in production to increase longevity. Limited external genetics are employed at the farm using AI. Cows calve for 45 days with numbers split evenly between spring and autumn. The conception rate is 96 per cent with barrens removed immediately. Cows are PD’d with a blood test 30 days after bulls are out. The optimum age to transition to a complete forage diet is considered to be seven months when calves are ‘long weaned’. Bulls weigh about 250kg and heifers 227kg. Calves are then vaccinated for respiratory viruses. Bull calves not needed for breeding are castrated using rubber bands and 15 per cent of heifers are kept as herd replacements. Each year, four or five promising bull calves are retained for breeding purposes. After one month, calves are weaned. They receive a second set of shots and remain in family groups until slaughter at 22 months. Steers and heifers are separated and moved to different farms. When cattle are ready to be finished they graze orchard grass/alfalfa leys in mobs of 50 and moved every day. A central farm alley was created to enable free movement and allow access to the central watering point. A prop pole to lift spring-tensioned electric fencing permits cattle to pass in and out of paddocks. Close attention is paid to forage management for Hedgeapple Farm’s fast finishing policy. On average, seven years grazing is achieved by alfalfa/orchard grass pasture before being reseeded with min-till equipment. First, Sudex, a sorghum/sudangrass hybrid, is sown in spring and grazed in summer before dying out in autumn. The following spring, alfalfa/orchard grass is direct drilled. During winter, cattle receive only alfalfa/orchard grass haylage and minerals. The 2016 drought required hay feeding to be implemented in October. Cattle often graze until February due to abundant forage. Angus steers typically weigh 586kg liveweight and yield a 330kg carcase, dressing out at 56.4 per cent. A heifer typically weighs 477kg liveweight and yields a 252kg carcase, dressing out at 53 per cent. About 300 cattle are needed in the finishing system to supply six to eight carcases bi-weekly all-year-round. When cattle are ready for slaughter, a small family-owned and USDA-inspected processing facility 40 miles away – Old Line Meats, Baltimore, Maryland – is used to ensure Hedgeapple beef is handled in a humane, safe and healthy manner. Carcases are dry-aged 14 days before returning cut, wrapped and flash-frozen. About 150 cattle are sold yearly through the on-farm retail market which operates three days per week, five hours a day. Customers come from a 100-mile radius and accept limited shopping hours. Trade through restaurants, farmers markets and online are unnecessary. 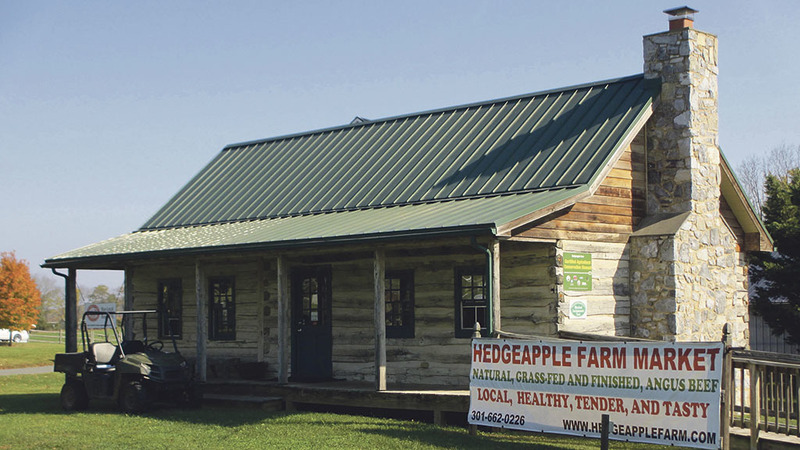 On-farm market sales generated are testament to the strength of the Hedgeapple brand. A critical component to the success is superior customer service. Every cut of meat sold at Hedgeapple is fully traceable. Spreadsheets help determine each carcase value. Data pertaining to yield and value is derived from every animal processed. This data is utilised to maintain profitability and manage the on-farm retail market. The monthly margin on each cut of meat is known and the current carcase value earns Hedgeapple exactly £2774.31. On average, it costs £7.62/kg of meat sold through the store, which includes offal and bones, net of production and processing costs. Dr Barao has developed innovative schemes to further increase Hedgeapple’s beef business. 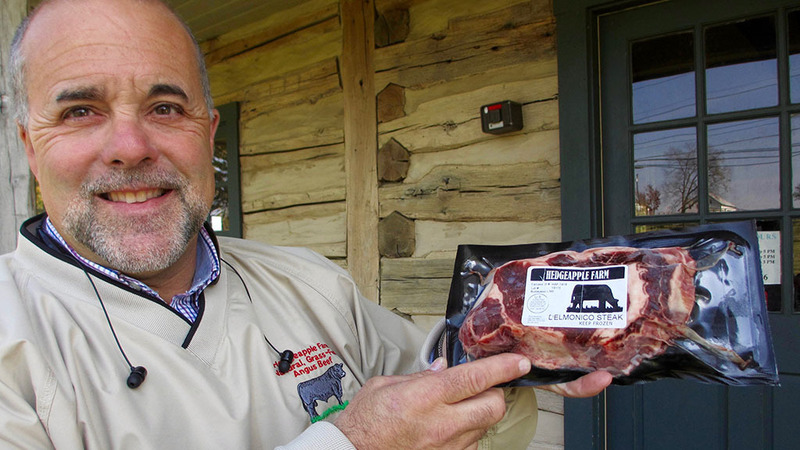 Three starter beef producers were incorporated into the business to help farmers get established. Another advantage was free management advice. Repayment is through a feeder calf buyback scheme. Once a cow is paid for, use of bulls and management advice is free. Also at no cost are replacements, since 20 per cent of starter farmer heifers are retained and readily available. New farmers manage cattle on similar pasture-based systems using the same health protocols. Dr Barao provides monitoring and, at weaning, calves are purchased by weight and at a premium. This practice encourages good husbandry and management. He says: “This really works for us as we are more set up to finish cattle. We can finish three beef animals for every cow calf unit. The logic behind Hedgeapple Farm’s business decision to support companion starter farmers means high performance feeder calves of known genetics are produced. The result is sustainable, reliable and profitable for both Hedgeapple Farm and these new Mid-Atlantic beef farmers.